Valentine’s Day is almost here!! It’s funny how even a holiday that symbolizes love can become controversial, with one camp declaring that you shouldn’t need “a specific day” to show your love, another going overboard with showing (and showing off) their love, a third camp trying to find their true love…I could go on forever but I won’t because I love celebrating everything! 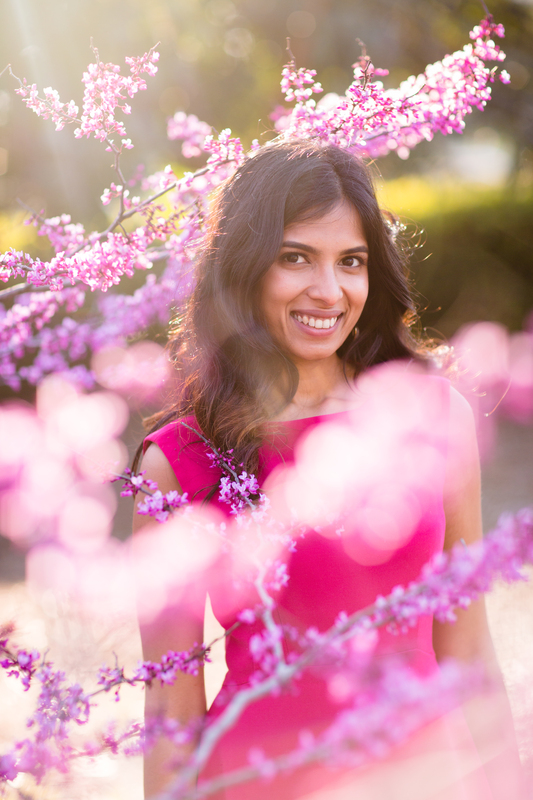 I’m serious, I love croissant day, pizza day, valentine’s day …. A cool byproduct of the controversial Valentines Day however was Galentine’s Day (noun: A day to celebrate and celebrate with your girlfriends), invented by the amazing Leslie Knope (seriously, if you haven’t watch Parks and Recreation yet, please drop everything and watch it). What are your favorite ways to celebrate Galentine’s er Valentine’s Day? 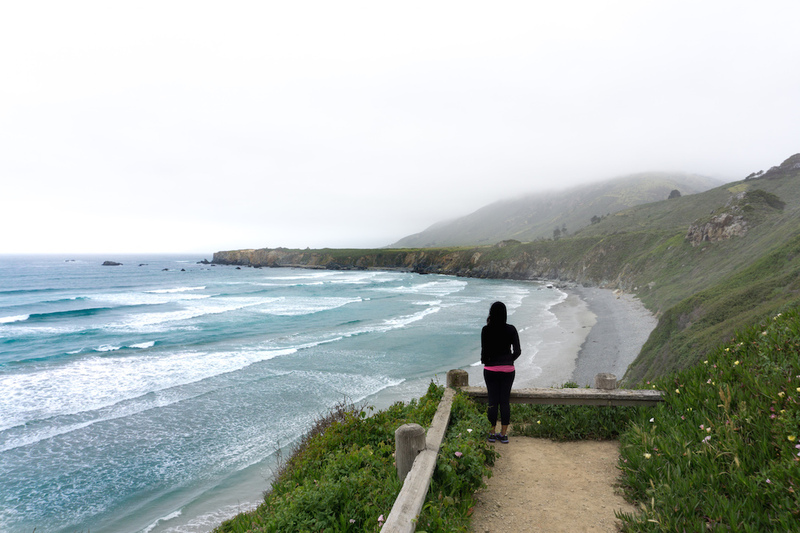 There are a million special ways to celebrate, but in this post I suggest one that works as both an amazing romantic date and a fun girlfriends date…. 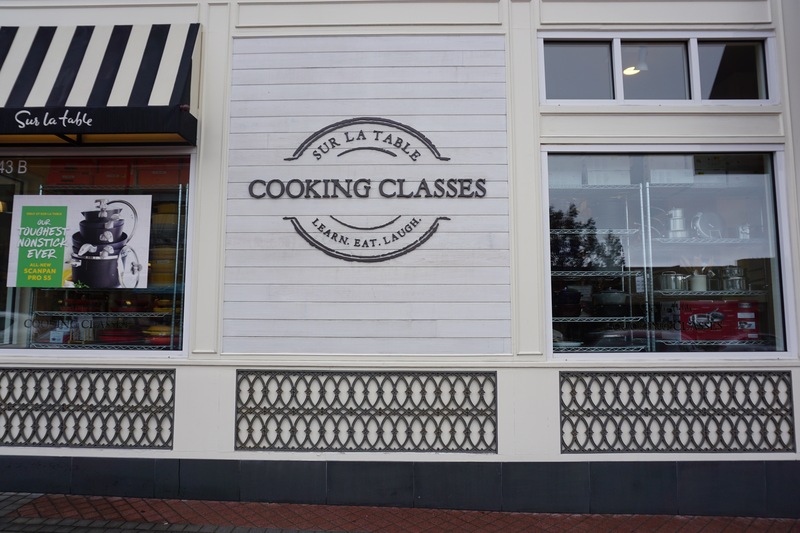 A baking class! 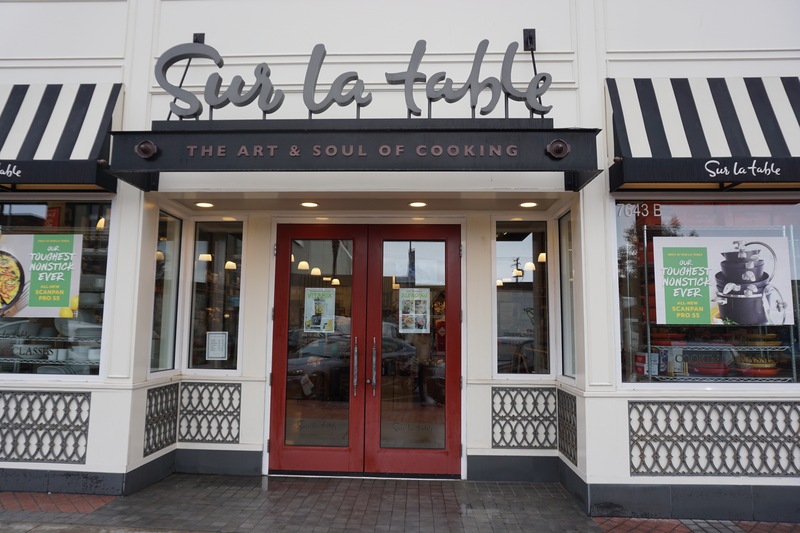 We chose to go to our local Sur La Table to learn how to bake the sinfully delicious french Macarons (not to be confused with a macaroon, which is a coconut cookie with a base of chocolate). 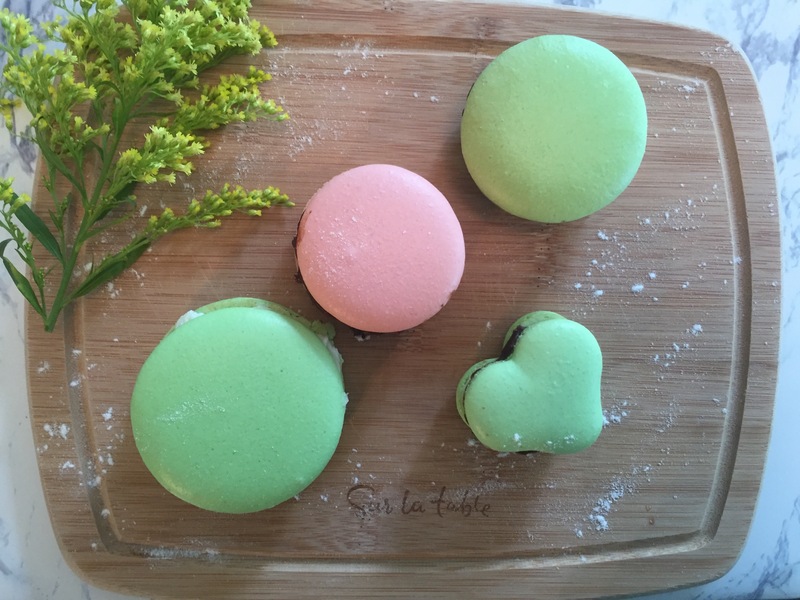 Macarons actually seemed to have originated in Persia, brought to Italy and then to France, possibly by Catherine de Medici, as simply an almond cookie, however the modern macaron was invented in Paris and popularized by my favorite bakery Ladurée. 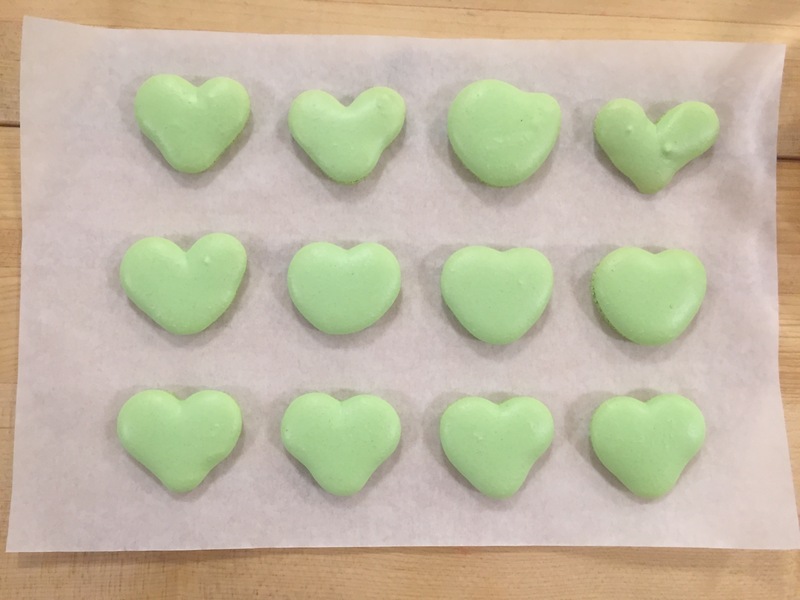 Read more about the history of macarons here. 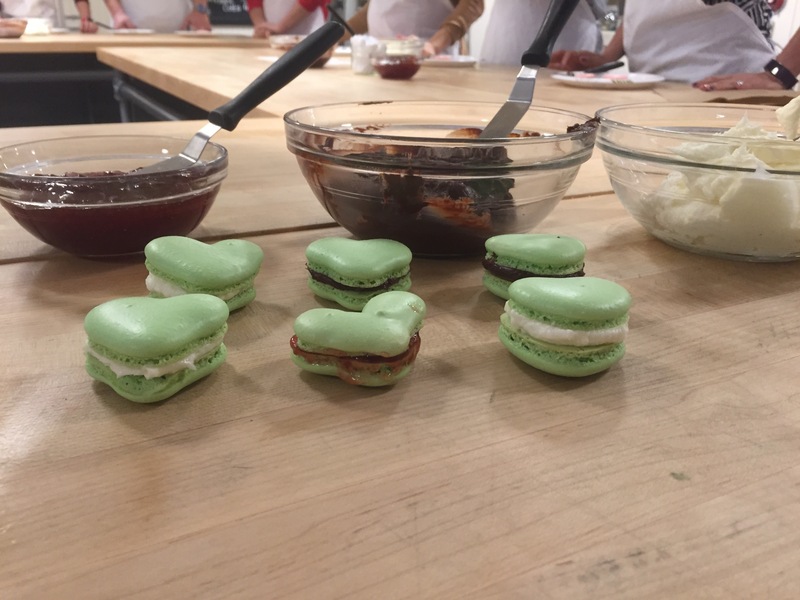 The first thing that we learned in class with Chef Lisa Porfirio was that macarons are made of three simple ingredients : almond flour, confectioner’s sugar and egg whites. But oh my, they are so complicated to make! 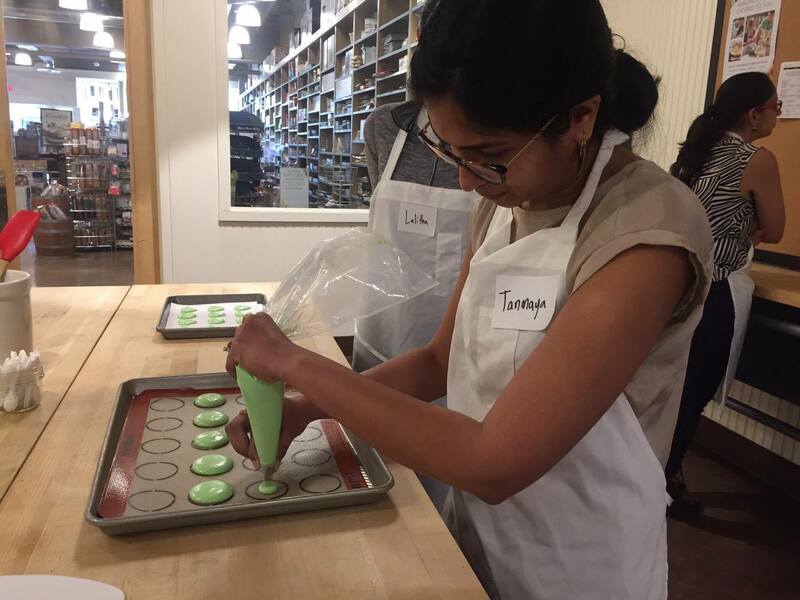 Tip: Do not try this at home during hot or humid conditions because macarons are very temperamental. 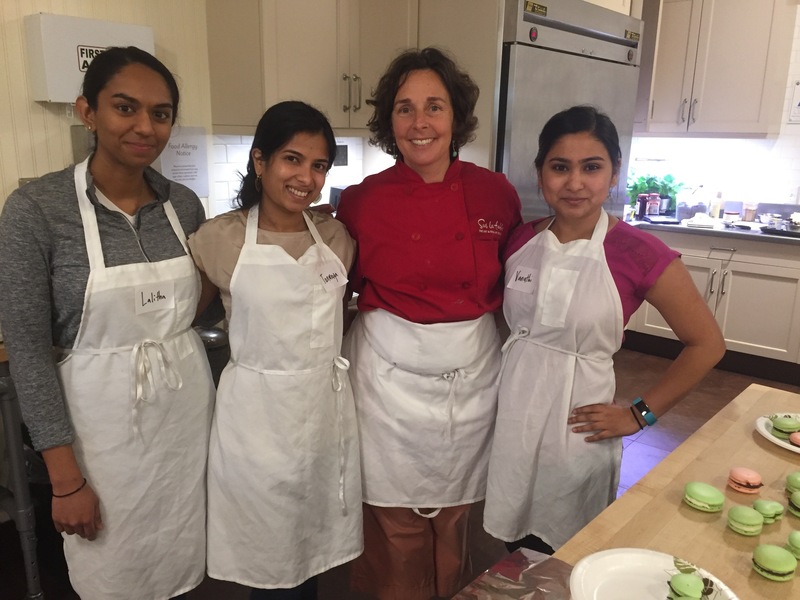 I enjoyed learning from Chef Lisa because she definitely keeps it real. 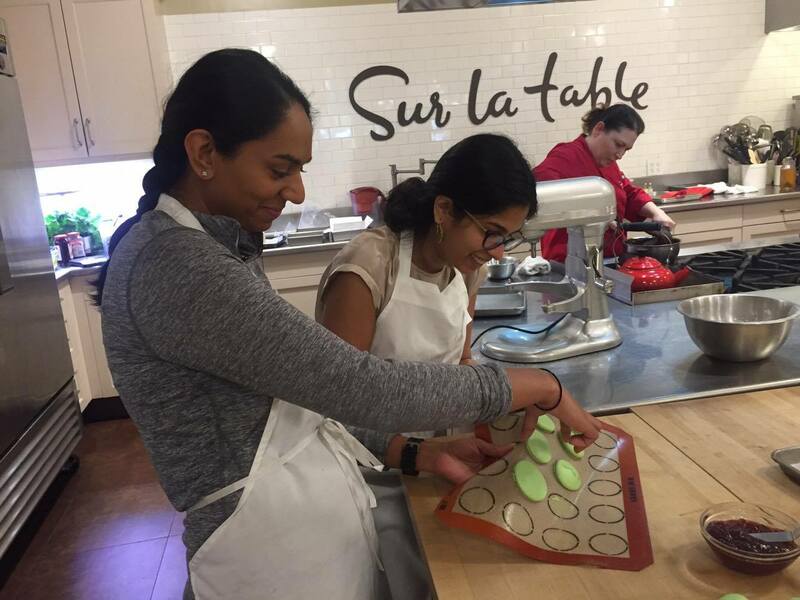 She warned us how hard it is to make the perfect macaron, but then guided us carefully to make some that were at least edible (Jk and spoiler alert..they turned out great!). Another very enjoyable aspect of learning from her were her analogies during the process of creating the meringue. “Add the cream of tartar after the egg whites start to look like toothpaste, then after it looks like shampoo add the sugar and whisk till it looks like shaving cream”. Love it! 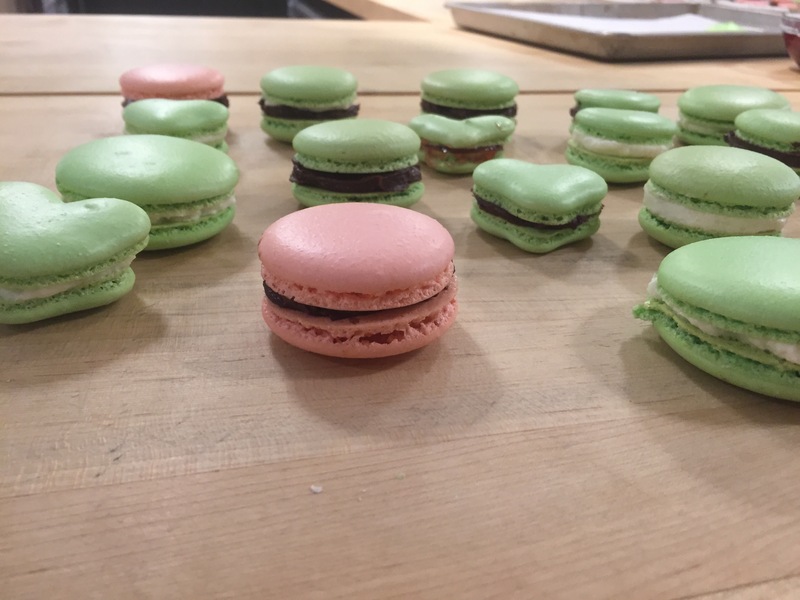 TIL : the different colored macarons are not because of different flavor, but because of different food coloring. After making these pesky things ourselves, we could definitely appreciate why they cost about $2.50 to $3 a pop! 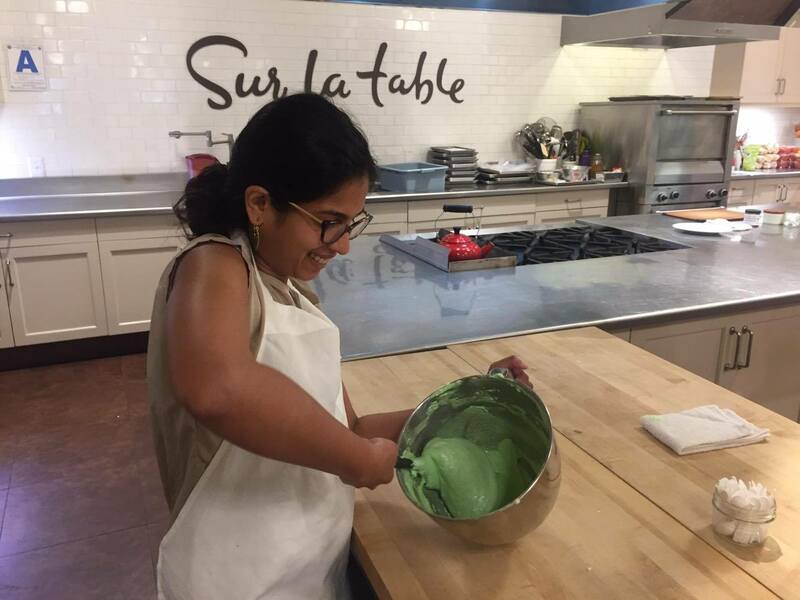 The cooking/baking classes at Sur La Table are so much fun, everything is ready and laid out for you, the kitchen is clean, the teachers are great and you come out learning a new skill! I definitely recommend it for Valentine’s Day, Galentine’s Day, Me Day or a date night activity! If you want to try one yourself, head to their page and find one in your city. 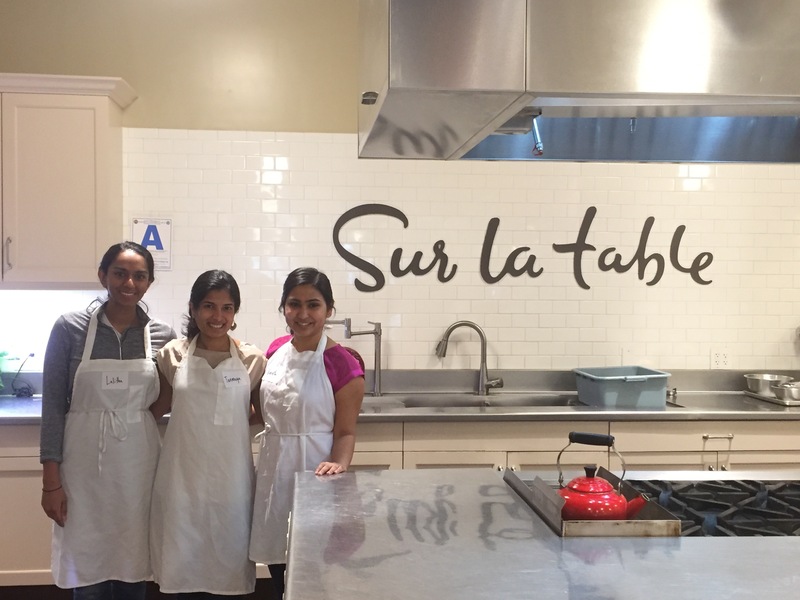 If you don’t have a Sur La Table, definitely try out any cooking class in your city, it’s just so much fun! 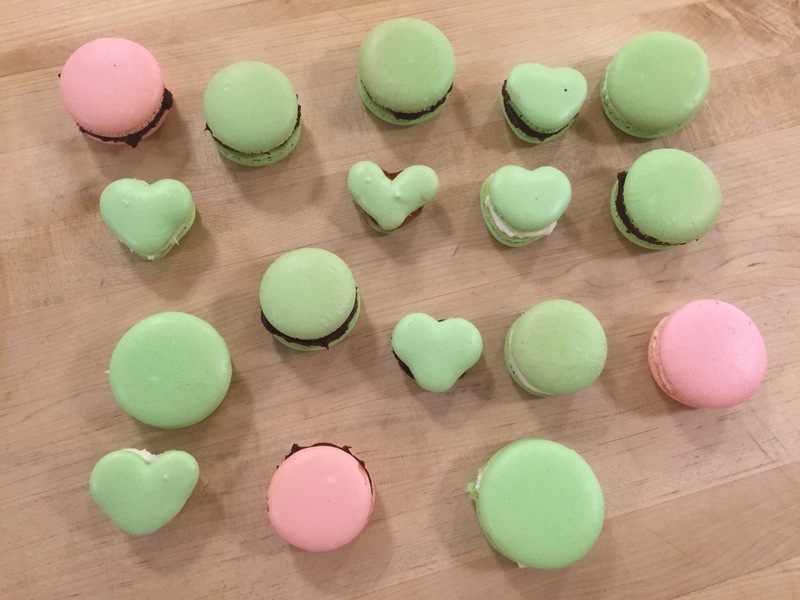 Also, if you, like me, love celebrating the special things in our lives with their own days, National Macaron Day (in the US) is coming up on March 31st!